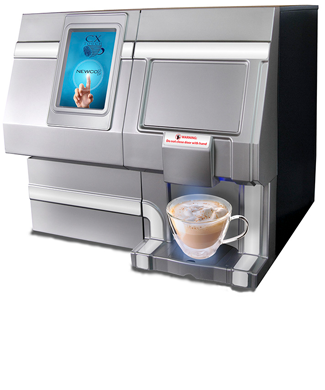 Enjoy delicious coffees, latte's, cappuccinos and more with the CX Touch. Blend soluble milk and chocolate with individual PODS of coffee and tea to create coffee house quality drinks. Simply scroll through the high resolution touch screen, select your drink, insert a POD and your drink is prepared in under a minute. No need to leave the workplace for great tasting coffee. Individual single portions of coffee and tea PODS provide an aromatic and enjoyable taste experience. Because PODS are brewed in a paper filter, all of the aroma and essential taste components are able to be extracted properly and enjoyed. Brighten up your work place with the aroma of freshly brewed coffee and enjoy the difference the CX Touch offers your employees and customers. CX Touch's innovative use of 2 lb. bulk hoppers for milk and chocolate drastically cut down on waste without sacrificing drink quality. One 2 lb.bag of milk and 2 lb. bag of chocolate is the equivalent of approximately 75 milk and 50 individual chocolate capsules in other brewing systems. The end result is a great coffee experience while helping to protect the environment - one cup at a time. CX Touch includes 87 preset recipes. Choose from coffees, teas, cappuccinos, lattes, shots of milk and/or chocolate and more. The Three variable strengths and three cup sizes are also included for most recipes. Drink recipes are pre-programmed and ready to use. Just plug it in and you are on your way to personalize your CX Touch just the way you like, even with a custom sleep screen. Yes. we can do that too!